Rome’s oldest forum, the Forum Boarium was once a busy cattle market and site of several temples, the remains of which can still be seen today. Much less famous than many of the city’s other ancient sights, the Foro Boario is one of Rome’s most interesting “secret” attractions. The Forum Boarium is across from the famous Mouth of Truth (Bocca della Verità) at the Church of Santa Maria in Cosmedin, but it’s often skipped by visitors as the temples are behind fences, so can only be seen from the outside. Consider joining a private guided tour of the “secret” sights of Ancient Rome to explore the temples up close, along with skip-the-line access to the more famous archaeological sites dating from the Roman Empire, including the Colosseum and Roman Forum. This commercially strategic market along the Tiber river was a major center of livestock trade as far back as the third century BC, and occupied a central location between Ancient Rome's Aventine and Palatine hills, along with the nearby Forum Holitorium produce market. Today, visitors can see the Temple of Portunus (Temple of Fortuna Virilis) from the first century BC and the Temple of Hercules Victor, ringed by a 20 columns. The Forum Boarium is also home to the Arch of Janus, dating from the fourth century. The Foro Boario is an outdoor archaeological site, so wear a hat, sunscreen, and comfortable shoes when visiting. The cattle market is an especially fascinating tour for Roman history enthusiasts, and those who want to explore some of Rome's more off-the-beaten-path sights. The Forum Boarium is located along the Tiber river near the Circus Maximus. Take bus 170 to the Bocca della Verità stop or metro line B to Circo Massimo. The archaeological site is outdoors, so visit in early morning or late afternoon in the summer months and on mild days with clear skies in winter. The circular Temple of Hercules Victor is often mistaken for the Temple of Vesta, another round temple ringed by columns located in the Roman Forum but only partially preserved. This tour is for all the first timers in the eternal city, your driver will meet you in the morning and take you directly to the very heart of ancient Rome.Your day will begin with the ancient sites: the Roman Forum and the Colosseum, you have part of the morning to explore these sites before driving to the Capitoline Hill to see the glory of the Michaelengo in Architecture, but just before you will also pass the very famous the Circus Maximus.Back to the most popular part of Rome you can visit the most famous of all ancient city temples, the Pantheon. Then a walk through Piazza Navona, see the Spanish Steps and the Trevi Fountain. There is time for a traditional Italian Lunch with time for shopping if you wish.In the afternoon, your tour continues with a visit to Vatican City to explore the richest collection of art in the world: the Vatican Museums, the Sistine Chapel, and St. Peter’s Basilica. At the completion of the tour, you will be driven back to your hotel. Learn about one of the most dramatic chapters in modern Italian history on a tour of Rome focused on the rise and fall of Mussolini's fascist regime. Trace the political climate that allowed the dictator to come to power in the 1920s, all the way to his downfall during World War II. Go beyond the typical tourist path to see remnants of this controversial period in landmarks like the EUR district and Mussolini’s former headquarters. UNESCO–listed Rome boasts some of the world’s most impressive Roman architecture, but the city’s popularity can make sightseeing a challenge. On this tour, beat the crowds and explore in comfort by luxury vehicle. Begin with pickup at your Rome hotel, and discover top attractions including Capitol Hill, the Colosseum, and the Roman Forum. Stop to explore on foot as your private guide brings the city’s ancient history to life. Explore some of Rome's hidden sights with a 3-hour small-group tour of rarely-visited churches and underground passages. See the churches of Santa Cecilia and San Crisogono in the historic Trastevere district. 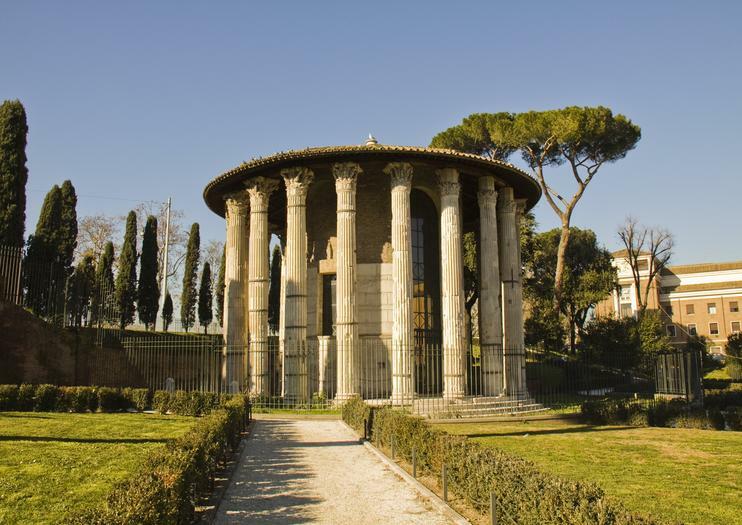 Visit the site of an ancient Roman cattle forum and the remains of the Temple of Hercules. Enjoy personalized attention from the guide in a group no larger than 13 people. Unlock the secrets of the ancient Roman Empire with the help of a private guide on this full-day walking tour. Travel back in time at Rome’s most important ancient monuments including the Colosseum, Roman Forum, Pantheon and Theatre of Marcellus, where you’ll learn about daily life and legends from Rome’s imperial past. Beat the long queues with skip-the-line access to the most popular sites, and feel free to ask all the questions you like on this customizable tour. Stop to rest your feet midday with leisure time for lunch. Explore Rome's top night highlights on 4 wheels. Whiz around on a private golf cart to discover the wonders of this ancient city with your expert tour guide.Relax in comfort as you glide around Rome in your very own private golf cart. Start your tour at your accommodation, as the sun sets, or anywhere in the city centre. Visit the best highlights the city has to offer at night, including Colosseum, Circus Maximus, and Palatine Hill. Learn about the history of this ancient city and the legends of the Mouth of Truth. Next, head to the Piazza Venezia, home to the impressive Vittoriano, and walk down the Trajan's Forum. Then, continue on to the famous Trevi Fountain and visit the lovely Piazza Navona with its peculiar ambience. You can be returned to your accommodation or another central location in the city. Fully private and exclusive walking tour which explores the fascinating origins and incredible stories behind the still standing triumphal arches between the Roman Forum archaeological area and Isola Tiberina. Time spent with your expert Archaeologist guide is approximately 2.5 hours. After your fully private tour experience which covers all the highlights of ancient Rome, your skip-the-line ticket into the mighty Colosseum kicks off the self-guided portion. Recommended time inside the Colosseum, Roman Forum, and Palatine Hill archaeological areas c. 1.5 hours.